I have hunted a lot of places around the world for a lot of Big Game animals and I can honestly say that I’ve never had more fun, over six days of hunting, than I did hunting with Patrick Fisher in Hawaii. I hunted with muzzle loader and crossbow and stalked animals all day long, every day, eventually taking all the animals I was after (9). It was a great hunt and I’ll be back. Pat Fisher is THE guy in the Hawaiian Islands! 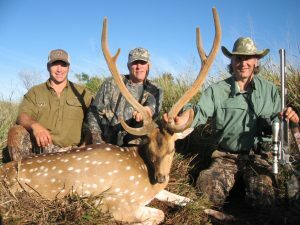 Fisher Outfitters has excellent properties on multiple islands, offering top quality hunting for all Hawaiian species. If you’re in the islands for a vacation and want to spend a couple days hunting…or if you’re serious about looking for the best trophies available on several different islands, Fisher Outfitters has the right package for you. My wife and I had a great hunt in January 2011, taking wild goat and feral sheep on Hawaii and a beautiful mouflon on Lanai. Our only regret is we didn’t spend enough time…but we’ll fix that next time! I’ve been fortunate to hunt many species of deer, all over the world. The axis deer hunting with Pat Fisher, in Hawaii, has been the absolute best deer hunting experience of my life. His goat and sheep hunting is second to none, and with so many other exciting adventures to be had in Hawaii, there’s a reason we keep coming back to this magical place. THANK YOU so much for the incredible experience this past week. It was unbelievable and a dream come true. You are topnotch! I have had the pleasure of hunting Polynesian Wild Boar, Spanish Goat, Hawaiian Ibex and most recently Hawaiian Black Sheep with Patrick. Each hunt was unique and a complete success in every way. Patrick is an outstanding guide, very knowledgeable of the game and their environment. It is a good day afield spent with Pat. I have hunted and filmed extensively around the world but there is no place like hunting in Hawaii. I started hunting with Patrick Fisher a number of years ago and have been coming back every year since. 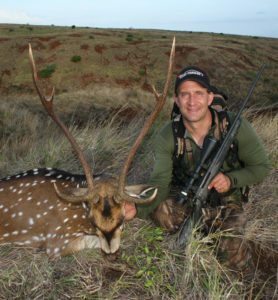 Patrick is truly a professional and has access to some of the best hunting property in Hawaii. Whether it is upland birds, turkey, or big game let Patrick guide you on your next hunt in paradise. As an avid international big game hunter, I have had the pleasure of hunting with Pat Fisher more than a dozen times. Without question, Pat is one of the most dedicated and skilled guides I have ever hunted with. His Determination to find you the largest trophy coupled with his easy-going personality makes for a memorable hunting adventure! I have had the pleasure of hunting Black Hawaiian Sheep with Pat and found him to be a a top notch professional guild with intimate and up to date first hand knowledge of the game pursued and the land hunted. Pat’s easy going personality, local knowledge and competence in the field made the hunt both a success and a pleasure. I can (and do) recommend Pat Fisher without reservation or hesitation, in fact I will hunt with Pat on my next trip to the islands. He’s a great individual and a great hunting guide! We have hunted with him on three seperate trips…I think that says a lot! He’s very professional and fun to be around and his service is UNSURPASSED! I have hunted 30-40 days/year for over 30 years. Pat Fisher is the best guide I have ever hunted with, period. I have gone hunting twice with Pat. The last time, May 14th, for black Hawaiian sheep. Pat’s determination got me a 32″ ram. It is so fun to hunt with Pat, I cant wait to go again. On a recent trip to Hawaii, I hunted with Pat Fisher for Hawaiian Black Sheep, Spanish Goat, Hawaiian Ibex Goat, and Polynesian Boar. Pat is definitely one of the best guides that I have ever hunted with. He is very knowledgeable of the animals and their habitat and knows where to find them. If you are planning a hunt in Hawaii, go with Pat and you won’t be disappointed. The next time I come to Hawaii, I’ll definitely be hunting with Pat Fisher. Dale Shughart, Jersey Shore, PA.
My 9 year old son, my 13 year old nephew and I hunted rams with Pat. He worked hard to get us three nice rams. Pat is a great guide with a fun personality. We all had the time of our lives. Skip the beach, go hunting with Pat. Our hunt with Patrick was a great time, we saw lots of animals and were able to take what we expected, plus had fun looking over the countryside and visiting with Pat, He has a plethora of knowledge of his game and how to hunt them. It’s a time I will never forget. I’ve hunted around the world and this was by far the most exciting hunt I have ever been on. My wife and I went to the Big Island for our 10 year wedding anniversary and I got approval from the boss for a one day hunt during our stay. I met up with Pat very early one morning and we hunted a ranch near Kona for Black Hawaiian Sheep. After a lot of walking, I finally got the nod from Pat and I connected on a nice ram. Soon we were off to the southern part of the island for a Hawaiian Ibex. Again, success! Pat is an extremely knowledgeable guide, as well as one of the most down to earth nice guys you will ever meet. And the scenery….spectacular! I can’t wait to go back and hunt a big Spanish Goat. See you in 2013, Pat! I have hunted various types of game all over the world. I have hunted with a variety of guides from all over the globe and different walks of life. I recently had the true pleasure of hunting with Pat Fisher. It was the experience of a lifetime. Pat is a true professional when it comes to every aspect of every hunt you embark on together. I hold Pat in the highest regard as a person and place him at the top, over any other professional hunter I have ever been on safari with. Hunt with Patrick Fisher once, you will hunt with him for life. 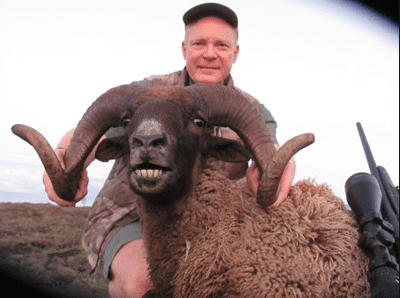 I have hunted many places in Hawaii, I have hunted goats, pigs, and axis deer, but the best and most enjoyed hunt I have ever been on was with Pat Fisher for trophy black hawaiian sheep. There was an abundance of game to view on our hunt and many interesting facts and stories told by Pat. I would recommend hunting with Pat to anyone, it doesn’t matter if you’re a novice or a professional, young or old, man or woman, you will have a great time having your Hawaiian hunting adventure guided by Pat Fisher. This was the second successful Axis Deer hunt that I have had with Pat Fisher, and resulted in the harvesting of a 32″ Axis Deer Buck shot at 293 yards. After approximately four hours of glassing and stalking, Pat spotted a large bedded down Axis buck over a ravine at 300 yards. He pointed out the location, but due to the numerous branches and heavy cover, I could not make out the location where the buck was bedded down. I got into shooting position and still had difficulty finding the animal. He said he would call the Buck, and hopefully the deer would stand up. He called and the deer stood up and presented himself to a perfect broadside shot. The shot was made and we found the animal, approximately twenty yards from where he was hit. All four hunters from our party bagged excellent trophies in two days, in a most enjoyable hunt. I have hunted big game in many places with guides and outfitters. I recently had the pleasure of hunting with Pat Fisher of Hawaii Safaris on Kona, Hawaii. Of all my adventures, my hunt with Pat will always be remembered as one of the very best. My goal was to hunt a Vancouver Bull. Pat was successful in guiding me to the trophy bull of a lifetime. What a great hunt! Pat works very hard but most important, he is an experienced, serious hunter and a man I respect. I will be hunting with Pat again real soon. Hunting in Hawaii with Pat is the hunting experience we dream about and wish we could experience with all outfitters. Pat is an excellent professional and a great guy. Pat knows the wildlife and their habitat. All our hunting is done in a 100% fair chase game-rich environment. We went after Spanish goats on our first hunt. The morning hunt was one of those beautiful days that we will remember forever. The weather was perfect and we were high in the hills overlooking the ocean. Groups of goats could be seen grazing hilltops. We did two sneaks on a small group, trying to maintain cover. We finally got into a good shooting position at about 200 yards where I shot a trophy goat. On our way back to the truck, we jumped a nice Polynesian boar that Dave shot. We tracked the boar to the area where the truck was parked. The boar jumped out of the tall grass and attacked the truck. Dave put him down for good with a final shot. The weather turned very bad for the afternoon hunt. The weather can change fast in Hawaii, just like most places. The goats do not like rain, so they were scarce. We thought the hunting was over, but Pat knew where to go. The goats hold up in lava tubes during rain, so Pat took us to a big lava tube where the goats came boiling out. Dave shot a great trophy Billy. We were hooked on hunting in Hawaii with Pat. On our next hunt we decided to hunt turkeys in the morning and Ibex in the afternoon. Pat set us up on a turkey stand before light. The birds were gobbling as the sun came up. Pat called in several Toms and Dave took one with a 10 inch beard. After a few minutes, Pat called in another Tom for me. We went after Ibex after a short break. As we worked our way down toward the ocean, we were spotting small groups of Ibex. A couple of nice Billy’s were spotted within about a hundred yards and Dave put down a good trophy with one shot. Another group was bedded and grazing in a tree thicket about half a mile below. We did a stalk and got into position on a huge Billy that was playing hard to get. Finally, I was able to get an excellent shot. Check out that trophy Ibex at the top of Pat’s web site. We went after the Black Hawaiian sheep on our next hunt and did some turkey calling along the way. We were hunting high in the mountains southeast of Kona. Spotting a small group of sheep we did a stalk to within 50 yards of a nice ram. There is a lot of terrain and cover to use when doing a stalk. Fortunately, I put the ram down on the spot with one shot, or I would have taken a lot of heat. When looking for Dave’s sheep, we set up on some turkeys we heard gobbling. Pat called in a nice Tom to me from about 300 yards out. Later that afternoon, we spotted a group of sheep and did a stalk to within about a hundred yards. There was a huge ram in the group and Dave easily put him down. After processing, we were heading down for the day and decided to set up one more time for turkeys. Pat called in five Toms to Dave. That was an impressive sight and the end of a great day of hunting in paradise. We went looking for hogs on the next day. We went into the field before light and started seeing hogs just as we could barely see to shoot. Dave took aim at a nice hog in a group of two that were running at full speed. I know Dave is a great shot, but this shot really impressed me. The hog went down hard at about 150 yards with very little light. Not wanting to waste any time, we threw the hog in the truck and headed up the small dirt road higher into the mountains. All of a sudden a nice lone hog was spotted running at about 100 yards. I got into position for a shot, but couldn’t get on the pig. Finally, the hog got to the crest of a hill at about 200 yards and was silluetted on the horizon long enough for me to make a great one-shot kill. We all knew there was nothing beyond just in case I missed. We were down at the Hawaiian Style Café having breakfast by 9:30 AM. We will be back with Pat. We still have more Hawaii hunting to do. This June my son and I had another great Axis Deer hunt on Molokai. Pat is an incredibly knowledgeable guide and a great person to be with. Hunting with Pat in Hawaii is a unique, high quality experience no hunter should miss. I have hunted with Pat on Maui, Lanai and the Big Island of Hawaii for pheasants, wild boar, axis deer, Hawaiian black sheep and mouflon ram. Every hunt has been a complete success and loads of fun. 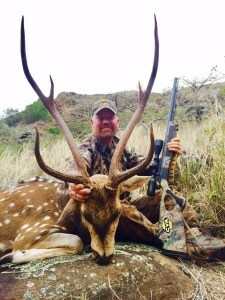 I have hunted in Africa, New Zealand and I have used other guide services in Hawaii. Pat is by far the best guide I have ever had anywhere. On our most recent trip to Lanai my son and I enjoyed a very successful hunt for axis deer and mouflon ram. He put both of us on trophy animals the same day. As always he was knowledgeable, professional and he was great with my son. I highly recommend Pat and plan to hunt with him many more times in the years to come. I have hunted all over the world and Pat Fisher is one of the best outfitters/guides in the hunting world; it was a sincere pleasure to hunt with him. Hawaii is the hidden jewel of hunting…free range axis deer hunting in paradise! Thanks for a great hunt Pat, I cannot wait to return to Hawaii to hunt with you again. Had the great plesure to hunt with Pat, I live and hunt in Alaska and hunting with Pat is a refreshing change to the norm in AK, the weather was great, seen plenty of game, He took great care of my trophy..as if it were his own. I will hunt with him again. thanx Pat, See you next year!